Software Testing - What?, Why?, When? "Software testing is an investigation conducted to provide stakeholders with information about the quality of the product or service under test." Software testing can also provide an objective, independent view of the software to allow the business to appreciate and understand the risks of software implementation. Test techniques include, but are not limited to, the process of executing a program or application with the intent of finding software bugs (errors or other defects). 1.meets the requirements that guided its design and development; 2.works as expected; and 3.can be implemented with the same characteristics. 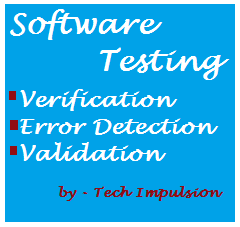 Testing software is operating the software under controlled conditions, to (1) verify that it behaves “as specified”; (2) to detect errors, and (3) to validate that what has been specified is what the user actually wanted. 2.Error Detection: Testing should intentionally attempt to make things go wrong to determine if things happen when they shouldn’t or things don’t happen when they should. Testing in itself cannot ensure the quality of software. All testing can do is give you a certain level of assurance (confidence) in the software. On its own, the only thing that testing proves is that under specific controlled conditions, the software functioned as expected by the test cases executed. 3. What is Software “Quality”? "Quality software is reasonably bug-free, delivered on time and within budget, meets requirements and/or expectations, and is maintainable. " However, quality is a subjective term. It will depend on who the ‘customer’ is and their overall influence in the scheme of things. A wide-angle view of the ‘customers’ of a software development project might include end-users, customer acceptance testers, customer contract officers, customer management, the development organisation’s management/accountants/testers/salespeople, future software maintenance engineers, stockholders, magazine reviewers, etc. Each type of ‘customer’ will have their own view on ‘quality’ - the accounting department might define quality in terms of profits while an end-user might define quality as user-friendly and bug-free. 4. What is “Quality Assurance”? “Quality Assurance” measures the quality of processes used to create a quality product. Software Quality Assurance (‘SQA’ or ‘QA’) is the process of monitoring and improving all activities associated with software development, from requirements gathering, design and reviews to coding, testing and implementation. It involves the entire software development process - monitoring and improving the process, making sure that any agreed-upon standards and procedures are followed, and ensuring that problems are found and dealt with, at the earliest possible stage. Unlike testing, which is mainly a ‘detection’ process, QA is ‘preventative’ in that it aims to ensure quality in the methods & processes – and therefore reduce the prevalence of errors in the software. Organisations vary considerably in how they assign responsibility for QA and testing. Sometimes they’re the combined responsibility of one group or individual. Also common are project teams that include a mix of testers and developers who work closely together, with overall QA processes monitored by project managers or quality managers. Quality Assurance and development of a product are parallel activities. Complete QA includes reviews of the development methods and standards, reviews of all the documentation (not just for standardisation but for verification and clarity of the contents also). Overall Quality Assurance processes also include code validation. A note about quality assurance: The role of quality assurance is a superset of testing. Its mission is to help minimise the risk of project failure. QA people aim to understand the causes of project failure (which includes software errors as an aspect) and help the team prevent, detect, and correct the problems. Often test teams are referred to as QA Teams, perhaps acknowledging that testers should consider broader QA issues as well as testing. 6. What’s the difference between QA and testing? 3.QUALITY ASSURANCE measures the quality of processes used to create a quality product. In well-run projects, the mission of the test team is not merely to perform testing, but to help minimise the risk of product failure. Testers look for manifest problems in the product, potential problems, and the absence of problems. They explore, assess, track, and report product quality, so that others in the project can make informed decisions about product development. It's important to recognise that testers are not out to "break the code." We are not out to embarrass or complain, just to inform. We are human meters of product quality.